An optimal extraction method for the removal of templates from molecularly imprinted polymers (MIPs) is presented. The extraction method is based on pressurized hot water extraction (PHWE). PHWE was evaluated by application to three distinctly colored MIPs for chlorophyll (green), quercetin (yellow) and phthalocynine (dark blue) with subsequent monitoring of template removal and template bleeding by an ultraviolet spectrophotometer. The templates were washed-off and the extraction efficiency (EE) was compared to that of soxhlet and ultrasonic extraction methods. PHWE employed hot water at an optimal temperature of 220 °C, pressure of 50 bars and flow rate of 2 mL min−1 to thoroughly wash-off the respective templates from their MIPs. The EE evaluated for PHWE was over 99.6% for all the MIPs with no subsequent or minimal template bleeding (<0.01%). The washing procedure was simple and relatively fast as it was achieved in 70 min at the most. At 95% confidence level (n = 3), soxhlet and ultrasonic recorded EE that was not significantly different (<94.5% in all cases) from that of PHWE (>99.6% in all cases). 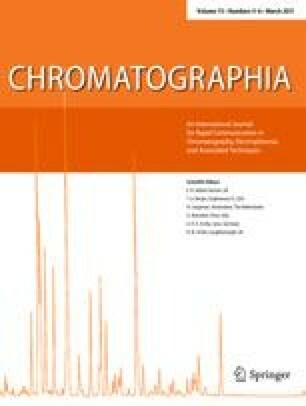 Soxhlet and ultrasonic had washing procedures that were slower (over 18 h) and employed large quantities (400 mL) of organic solvents modified with acids. The percentage relative standard deviations (%RSD) for the EE and recovery results were less than 2.3% in all cases indicating the high reproducibility of the method. Overall, the three methods performed comparably in extracting templates. PHWE seems to be the method of choice as it employed water which poses no environmental threat. This work was supported by National Research Foundation of South Africa, Agilent Technologies (USA), UNDP/GEF SGP, Andrew Mellon Foundation and STINT.